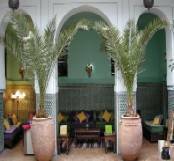 Riad Amazigh is a vacation rental home ideally located in the heart of Marrakech Médina; in the middleof the souks and near 'Jamae el Fenae square'. 3 suites and 2 rooms with a double bed; a living room area and a bathroom. 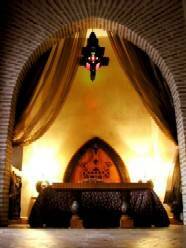 Each room has a personalized and original morrocan architecture design. A big wide hall richly decorated and containing a beautiful fireplace and a wall fountain. It's used as a small reception area as well as a daily art exhibition galery. 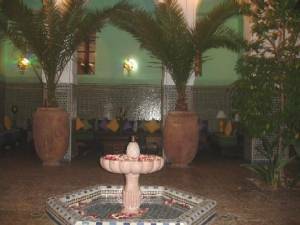 A nice Patio to relax in the mids of a green vegetation and the sweet sound of the water fountain. A luxurious spacious room richly decorated with a lovely fireplace and library corner. 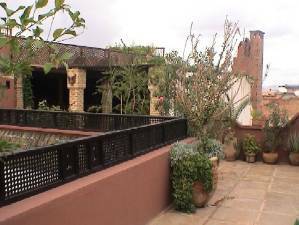 A big terrasse with green plants and a small bar. 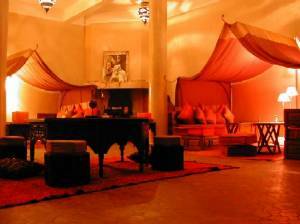 The terrasse offers a panoramic view over the magnificent Atlas and Marrakech Médina. a swimming pool, a Hammam; a gym and a massage room are under construction and will be ready in one year. A masseuse is available on request which you can book in advance. Our trained staff (Director, cook, waiters, cleaning staff and a chaufeur) will make sure to provide you with an unforgetable stay.